Lalique will launch Satine, a new fragrance for women inspired by the world of dance. 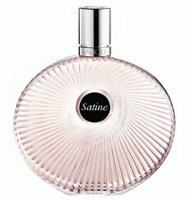 Satine was developed by perfumer Nathalie Lorson. Notes for the floral fragrance include jasmine, gardenia, heliotrope, tonka bean, vanilla, pink pepper, sandalwood, cedar, patchouli and suede. Lalique Satine will be available in 30, 50 and 100 ml Eau de Parfum and in matching body products. The bottle was inspired by a 1924 Lalique bottle, La Perle Noire. Update: Satine will also be sold in a signed and numbered limited edition 40 ml Extrait de Parfum. Although it wouldn’t surprise anybody if it had had oud in it, and I’m sure we’re all relieved that it doesn’t. Nice bottle. They’ve had a few duds over the years but we can generally count on Lalique for nice bottles. Will go for nice — not sure I love the bottle. Definitely looks like a pleated skirt that’s twirling. I am not sure if I dig the bottle though and I don’t do gardenia. Yes, I think that’s the look they’re going for. SIMPLY SUBLIME!!!!!!!!!!!!!!!! I LOVE GARDENIA! AND VANILLA! and that Bottle… PURRR!!!!!!!!!! Loving It Living It Wanting It! I’m a big gardenia fan too…hope this will be worth purring for. Not that crazy about the bottle… and I am now having Moulin Rouge the Movie musical numbers going off in my brain. Gorgeous bottle like always. I have encre noir since it came out, I may give this new one a go when it launch.